My first trip ever to California for Postural-Visual Integration this last weekend did not disappoint! Sensory awareness (aka Vision) and how it can impact physical performance is what our two days were all about. Between the truly amazing visual scenes at the course location and the coast, the smells and sounds from the ocean and a ballpark, and the sight and sounds of a group of people having fun learning it was a weekend I’ll always remember. Sensory experiences change lives; this was reinforced by a text I received the morning after the course from an attendee working with an 82-yr-old who has serious balance problems who was walking better during his visit using visual techniques learned the day before. I couldn’t be more fulfilled! Thanks to Skip George and John Swain for hosting at this incredible venue! It could not have been more perfect for a course all about “sensing” the space around you and the ground under you. Thanks also to all the attendees, a great mixed group of PTs, OTs, trainers, strength coaches, massage therapists, and a behavioral optometrist, for indulging Ron and I for two days while we played verbal ping-pong! Here’s to Moving Beyond Sight! As Lori made toast after toast! Postural Respiration – Now Approved for BOC Evidence Based Practice! We are excited to announce yet another PRI primary course has been approved by the Board of Certification, Inc. (BOC) for Evidence Based Practice (EBP). Postural Respiration – An Integrated Approach to Treatment of Patterned Thoraco-Abdominal Pathomechanics (Live and Home Study) has been approved for EBP CEUs beginning August 20, 2015. This program has been approved for a maximum 15.0 hours of EBP Category continuing education. This program has been approved for a maximum 13.5 hours of EBP Category continuing education. Just finished up a weekend spent with a respectful, attentive, joyful and diverse group of practitioners in Palo Alto! We learned together about upstairs and downstairs of a pelvis, quadrants of fun and how to “think sync” with the thoracic and pelvic diaphragms. Many thanks to Chris and Allen for your help with host responsibilities, to Agile Physical Therapy for letting us utilize their beautiful facility and to PRT’s Caleb and Matthew for their graceful help during lab time. I had a chance to visit Stanford University Sunday after the course and enjoy the history and beauty of the campus as well as the outdoor sculpture garden. Enjoyed a great group of learners and a beautiful scene afterward! PRC Application Deadline Approaching Quickly! It's that time of the year again! I just received my first PRC application in the mail! Reminder that the Postural Restoration Certified (PRC) deadline is less than a month away, September 15th, and since it will likely be another large group, we will limit the credentialing program to the first 30 applicants. Two copies of each application (including full text of the articles used in the article review portion) must be mailed to PRI, and received by September 15th to be considered for testing this December. Are you planning to apply this year? If you are preparing your application, and have any questions, please call or email me! James and I had the opportunity to take our first round of pictures recently for the PRI® Fitness and Movement Course. 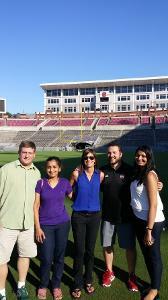 Special thanks to Ryan Holleman and Rob Murphy for their assistance and hospitality. Go Wolfpack! Our model, Matt, presented in a typical pattern which affects axial skeleton movement and proximal stability (Left AIC, bilateral BC, superior T4). We were able to reconfigure his thorax shape, diaphragm and air flow patterns with about 15 minutes of manual techniques to inhibit polyarticular chains of muscles which were dominant, then we strategically sequenced movement variability with a PRI® principle based workout. No formal correctives or rehab exercises were done. Our workout included modified RDLs, Beckman step ups, back squats, goblet squats, use of various Hammer Strength machines and much more. After nearly 4.5 hours of exercises, we retested Matt and not only did he remain neutral in all three planes both across his pelvic girdle and shoulder girdle, he tested better and was surprised at how good he felt (we did not test during the workout, only post). Pre workout: HGIR right 38, left 70. Horz abd right 20, left 10. Add drop right -, left +. Pass FA abd right +, left -. SLR right 75, left 65. Post workout: HGIR right 90, left 90. Horz abd right 55, left 60. Add drop right -, left -. Pass FA abd right -, left -. SLR right 85, left 85. 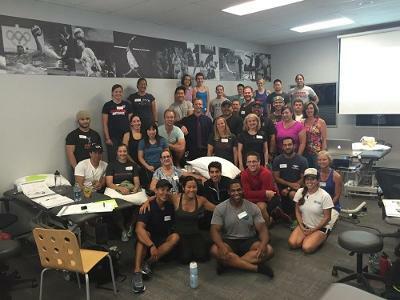 To learn what we did, we hope to see you at our PRI® Fitness and Movement course this October. Space is limited, so please do not wait to sign up! We are confident PRCs and PRTs will enjoy perspectives presented in this course, as well as new attendees to the PRI® science. Come ready to learn and we will be ready to share some great information! Hope to see you there! 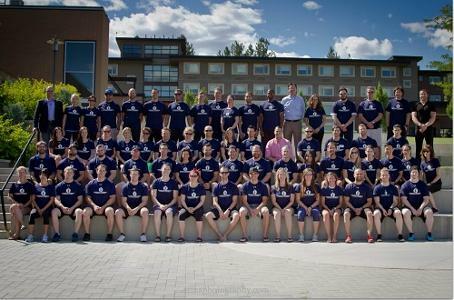 I recently had the opportunity to travel to Kelowna, British Columbia to present at the Okanagan Strength and Conditioning Conference at the University of British Columbia. Hosts Chris Collins and Greg DuManoir did a great job putting on a wonderful 3 day performance conference, that included a day 1 pre-conference VIP package and 2 days of amazing speakers and breakout sessions. I one of 2 presenters invited to speak in the pre-conference session, where he introduced basic principles of PRI and conducted a clinical evaluation and also discussed fundamentals of program planning. My keynote address the next morning was "Realizing Tri-Planer Athletic Performance through the Respiratory Diaphragm" and an afternoon full group lab session where principles of evaluation and treatment were demonstrated. All in all, it was a world class event that is clearly gaining a strong reputation in Canadian Performance circles and beyond, because of all the work put into the event by its hosts. Thanks again Chris and Greg for helping to make this year's conference an amazing success! North Carolina State University was the beautiful host location for PRI Vision Integration for the Baseball Player this past Sunday. Special thanks go to Ryan Holleman assisted by Jason Robey for all the hard work that went into making this happen, to Josh Olinick and his wife Katie for sharing their home, family, food, and most importantly time with me, and also to Josh for providing the manpower to show how the shoulder motion and thoracic position changed at least 25 different times before and after each vision technique! I thoroughly enjoyed the room full of diverse backgrounds, since the vision concepts can be applied to patient populations other than baseball players. And it was especially nice to have several familiar faces for my first solo run of this course; I always love to see members of the “Carolina Contingent”! I think everyone in the room benefitted from the experience of our willing volunteer, a strength and conditioning coach for college baseball and former player, who was kind enough to be the model for our assessment and technique demonstrations. Jon, your input and sharing with the room was invaluable! All in all, mission accomplished! I am already looking forward to the next one! 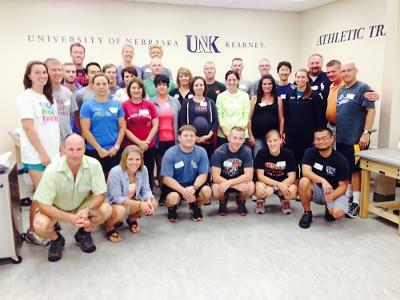 Traveling to the middle of Nebraska to teach Myokinematics at the heart of Nebraska in Kearney was such a treat! Seeing old acquaintances and meeting new associates after smelling fresh alfalfa, seeing crop dusters flying and pivots moving water while traveling down I-80 reminded me of my roots and family ties. The Athletic Training Education professors and graduates reflect the values and beliefs of what make this country great. This particular course, therefore, centered around practical, meaningful, and purposeful PRI technique applications so that outcomes would also be great.